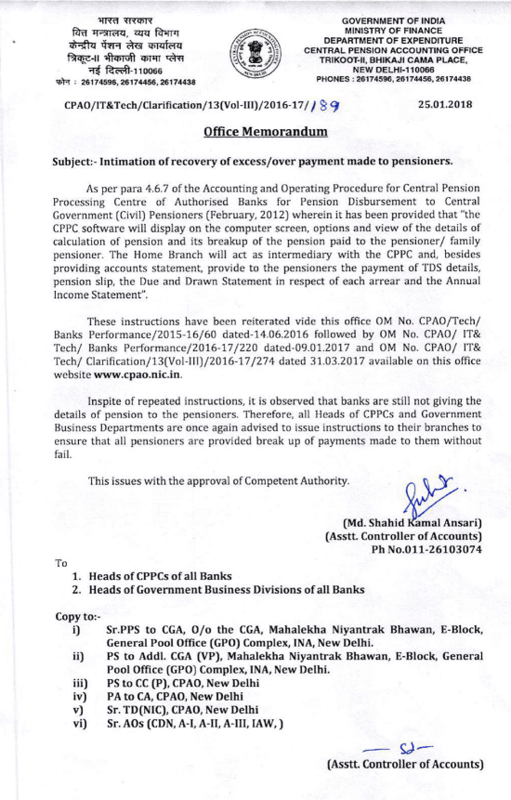 As per para 4.6.7 of the Accounting and Operating Procedure for Central Pension Processing Centre of Authorized Banks got Pension Disbursement to Central Government (Civil) Pensioners (February, 2012) wherein it has been provided that “the CPPC software will display on the computer screen, options and view of the details of calculation of pension and its breakup of the pension paid to the pensioner/ family pensioner. The Home Branch will act as intermediary with the CPPC and, besides providing accounts statement, provide to the pensioners the payment of TDS details, pension slip, the Due and Drawn Statement in respect of each arrear and the Annual Income Statement”. These instructions have been reiterated vide this office OM No. CPAO/Tech/Banks Performance/2015-16/60 dated 14.06.2016 followed by OM No. CPAO/ IT&Tech/ Banks Performance/2016-17/220 dated-09.01.2017 and OM No.CAPO/IT&Tech/Clarification/13(Vol-III)/2016-17/274 dated 31.03.2017 available on this office website www[dot]cpao[dot]nic[dot]in.